Download a print ready version of this recipe. Mix the shallot and vinegar in a small bowl. Sauté the pancetta in a medium skillet over medium-low heat, stirring on occasion, until crisp, 5-8 minutes. Combine the mache, cherries, fennel, and warm pancetta in a large bowl. Toss with the dressing. 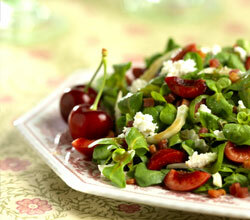 Divide between plates and scatter each salad with goat cheese and nuts, if using.